Retford Lifesaving Club offers an extensive range of awards and qualifications for people of all ages and abilities. The awards cover fitness, technical knowledge, skill and judgement when dealing with simulated incidents – each of which require varying levels of proficiency. Read more information about our scheme of awards below. 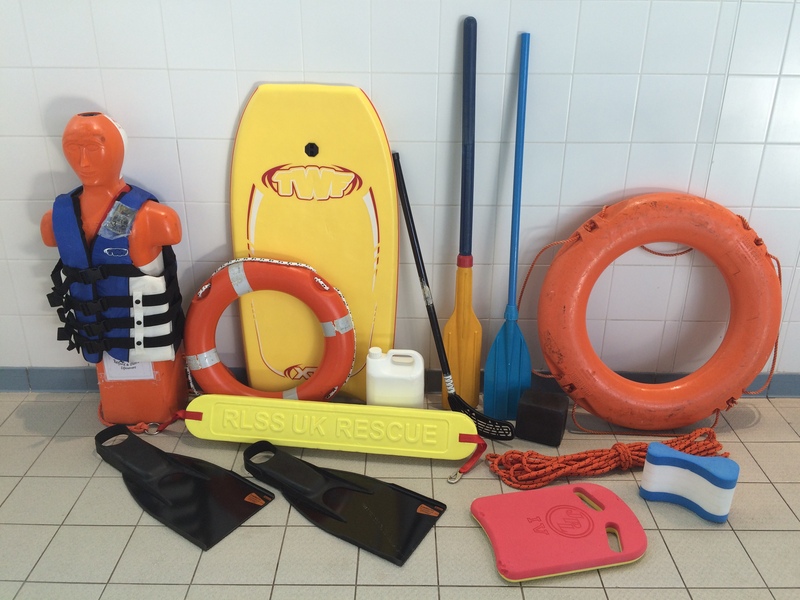 Some of the wide range of equipment that we use in our pool training sessions at Retford Lifesavers! Rookie Lifeguard – Targeted at 8-12 year olds, the Rookie Lifeguard programme has been developed in conjunction with the Amateur Swimming Association and the National Plan for Teaching Swimming. There are 3 stages; Bronze, Silver and Gold, and each stage is subdivided into 3 levels. Each stage takes roughly 1 school term to complete, and a pupil can enter the scheme at any point and then progress at their own rate. Items can be signed off as soon as they’re completed and don’t need to be completed all in one session. Visit the Rookie Lifeguard website for more information. Survive and Save – The Survive and Save programme has been developed by the RLSS UK to address the current drowning environment, with an increased focus on self-rescue and survival skills to tackle identified areas of risk. The Survive and Save awards are a suite of progressive stages that teach personal survival, rescue, sport and fitness alongside the relevant skills and knowledge for lifesaving to anyone over the age of 12 years. The awards are structured into three levels (Bronze, Silver and Gold) with four awards available at each level (Medallion, Beach, Stillwater and Sport). The Core Element of each level ensure that candidates learn all of the key skills and knowledge at each level, regardless of which award strands they choose to follow. Candidates who show the highest levels of Lifesaving skill – by achieving three gold awards within a period of 24 months – automatically receive the Distinction Award, which is the highest award in the programme. For more information on the Survive and Save programme, visit the RLSS UK website. A safety boat ready for action at the Rescue 2014 Beach and Ocean Championships. Life Support – The aim of the Life Support award is to train candidates in Basic Life Support, including the diagnosis and treatment of choking, bleeding and shock, and the performance of effective CPR on an adult demonstrating competency at this level. The aim of the Life Support 3 award is to train candidates in Basic Life Support including the diagnosis and treatment of choking, bleeding, shock, drowning and hypothermia, and the performance of effective CPR on an adult, child and infant – demonstrating excellence at this level. Find out more about the Life Support and Life Support 3 awards on the RLSS UK website. NPLQ and NRASTC – The National Pool Lifeguard Qualification (NPLQ) is widely accepted by swimming pools both in the UK and Ireland. Now in it’s 8th edition, this qualification also has full accreditation from the Qualifications and Curriculum Authority (QCA). Find out more about the NPLQ on the RLSS website. Endorsed by the DfES, the Institute of Sport and Recreation Management and the Amateur Swimming Association, The National Rescue Award for Swimming Teachers and Coaches teaches practical lifesaving skills that may be needed by anyone teaching or coaching swimming or other programmed activity in a pool. We run this course on demand from schools or other organisations. Find out more about the NRASTC on the RLSS UK website. If you have any questions or queries about the range of awards we offer, or have any specific requirements to discuss, get in touch via email, Facebook, or visit the Leisure Centre on a Saturday morning at 9am!